At VacuBlast, we utilise multiple Abrasive Blasting equipment depending on the project requirements. Both technologies produce minimise dust and cause minimal disruption to the surrounding area, making an ideal blasting solution for a wide range of on-site applications in Melbourne & Sydney. 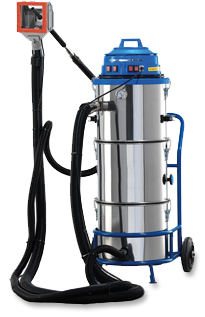 Our European manufactured Vacuum Blasting technology uses a negative pressure system, blasting within an enclosed chamber whilst simultaneously recycling waste and abrasive. As a result, this abrasive blasting method is specifically formulated for a niche range of internal projects across Melbourne & Sydney. At VacuBlast we utilise Dustless Blasting Technology. This eco-friendly Wet & Dry Abrasive Blasting technology is the perfect solution for any on-site blasting projects, eliminating the need for containment and plant shutdown due to minimal disruption to surrounding areas. Employing American manufactured technology, our high-quality machines can be used to assist on a range of project applications, producing 50% less waste and 95% dust reduction in comparison to traditional sandblasting methodologies. For more information on our technology, get in touch with VacuBlast today. Call our Melbourne & Sydney team on 1300 986 877 – we’ll be happy to answer any questions you may have.